I love Robin Mead from Headline News and I watch her religiously every single morning. Love her I tell you. But... because I have her on in the lobby of my place of employment and it is a news station that reports the headlines of the day; playing them repeatedly all day long, I hear the same freakin' news story all day long. My crush on her makes it tolerable. 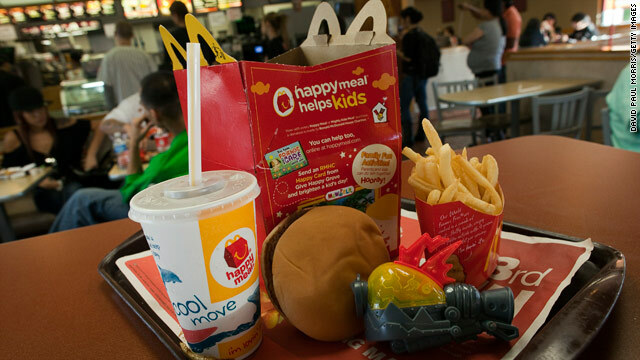 Until today's story: Woman sues McDonald's over Happy Meals. I really want to shake this woman who is suing McDonald's because she just sounds like an idiot. Without your permission???? Are you kidding me??? Turn off the TV. Tell your child no. What about every other commercial out there that is saying "buy me, buy me." Get a life. Get a spine. Drop the lawsuit for no other reason then to save the American consumer their tax money on these frivolous "I hope I can get rich" lawsuits.